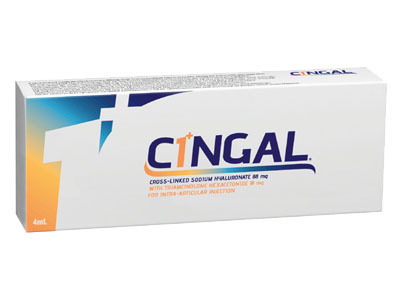 Cingal is a single intra-articular injection viscosupplement formulated to provide the benefit of a cross-linked hyaluronic acid (HA) and a fast acting steroid to effectively treat the symptoms associated with osteoarthritis (OA). 22mg/mL effective HA concentration. Cingal is an effective non-animal treatment for knee pain of osteoarthritis. The combination of steroid and hyaluronic acid (HA) will provide a rapid and long lasting pain relief through 6 months.